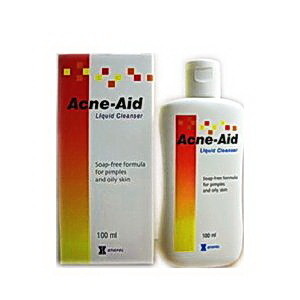 Stiefel Acne-Aid Liquid Cleanser (100 ml) Condition : New in Box Size: 100ml Guaranteed authentic Acne-Aid Liquid Cleanser is a mild, soap-free cleanser specially formulated for pimple-prone and oily skin conditions. It cleanses the skin gently and thoroughly. The special formulation prevents skin dryness and helps maintain skin’s normal, healthy pH. Benefits Remove excess oil dirt Maintains normal skin condition and healthy skin pH Wash fresh without tightness feeling Suitable for pimple-prone and oily skin conditions No Sodium Lauryl Sulfate (SLS) Direction: Use on the face or other areas affected by pimples or oily skin conditions. Wetskin, apply sufficient amount of Acne-AidLiquid Cleanser and work out lather, massage gently before rinsing with clean water and pat dry. The skin will now feel clean, smooth and soft * All payment should be made within 3 days * Accept only PayPal for payment * Ship to Worldwide (*** Except ITALY FRANCE ***) * One Price Shipping to worldwide * Ship by Airmail from Thailand * Ship in 3 business days after received payment * It take about 14-25 days to most countries No return Accept FreeAuctionDesigns.com Free Auction Template Designs More!